Acctivate can quickly filter and display a list of sales orders that have been shipped and are now ready to be invoiced. In Acctivate select to open the Order Manager. 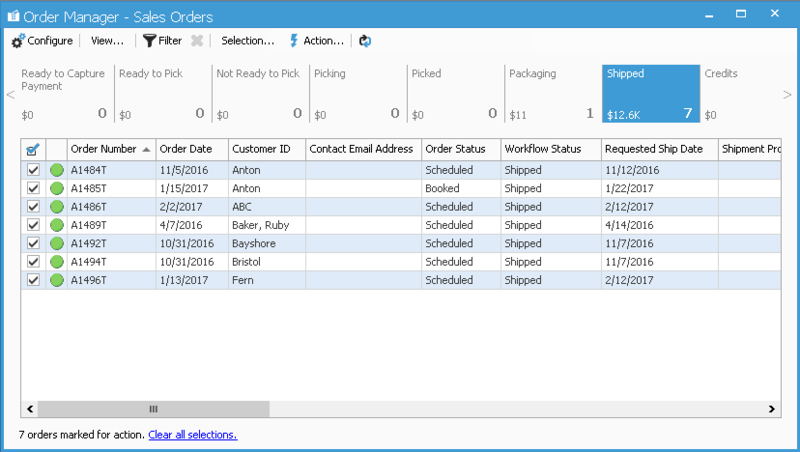 In the default Sales Orders View, scroll to the right side to the “Shipped” button to view all open scheduled sales orders that have a workflow of “Shipped”. Here, you can review these sales orders and, if you are ready, you can invoice the sales orders in a batch. Check the box next to the orders you are ready to invoice or select the whole group, then go up to the Action menu and select to Prepare Invoices.